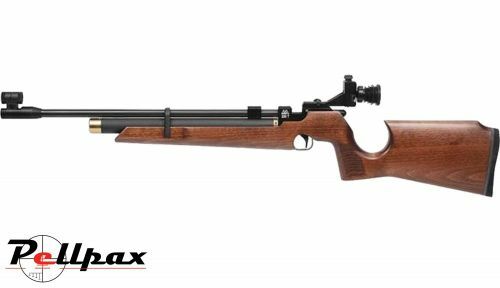 The Air Arms S200 Target is a perfect rifle for plinking and starting off in the Field Target Shooting.This PCP rifle comes in a .177 calibre offering high accuracy. The stocks ergonomic design makes it Ambidextrous allowing you to shoot with your preferred hand. Built from beech wood the stock is extremely durable but pleasing to look at. The S200 is ideal for a beginner pcp rifle or for juniors. The adjustable Two stage trigger allows you to customise the shooting point allowing for a more comfortable shoot. The gun features a rear Dioptre sight & front tunnel sight allowing you to line up and shoot straight out of the box. With roughly 45 shots per charge the Air Arms S200 Target is a great all rounder. The barrel measures 484mm and the overall rifle is 900mm in length.